Standing in the western enclosure within the cashel is the church or domestic building known as Templenatinny, the House of Fire. 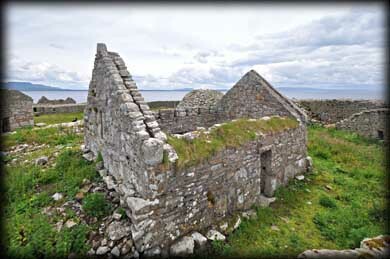 It is thought this building may have served as the kitchen for the monastery. In the centre of the building is a square hearth formed by flat stones set on edge. It is believed there was an eternal flame burning in it. This feature may pre-date the building and could be similar to the eternal flame at St Bridget's Temple in Kildare. Lying in the south-west corner is a millstone. . The hearth within Templenatinny can be seen as soon as you enter the passageway that leads to the church. 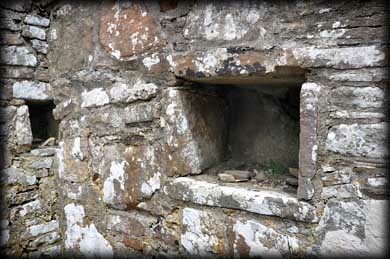 In the east wall of the church is a small niche that may have acted an ambry. Situated: In the western enclosure. Access is through the passageway next to Clocha Breaca. Discovery Map 16: G 5735 5387. Last visit June 2012.